If QUALITY is more important than cost? You should book the ONLY Professional family entertainer in Bangkok for your special family day. Clown Eckie does not offer commercial entertainment services in exchange for fees in Thailand. He is only available to entertain at your event in return for a donation to his registered charity. Before you book the ONLY professional family entertainer in Bangkok, you should know that the donation amount requested is going to be more than twice the normal rate for a party clown? 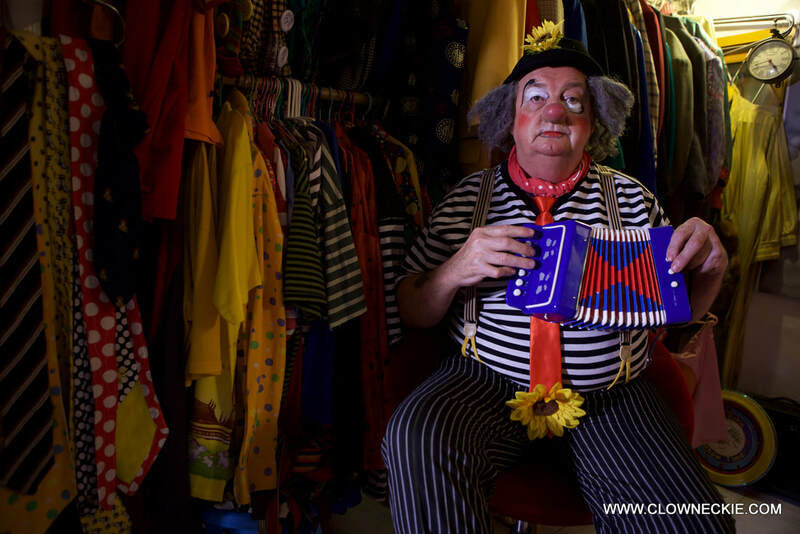 ​Clown Eckie is well known around Bangkok where he has been delighting children and amusing parents and teachers with his appearances at International schools, hotels and parties. He's also been performing free shows at a variety of worthy locations around Bangkok and all over Thailand since the year 2000. 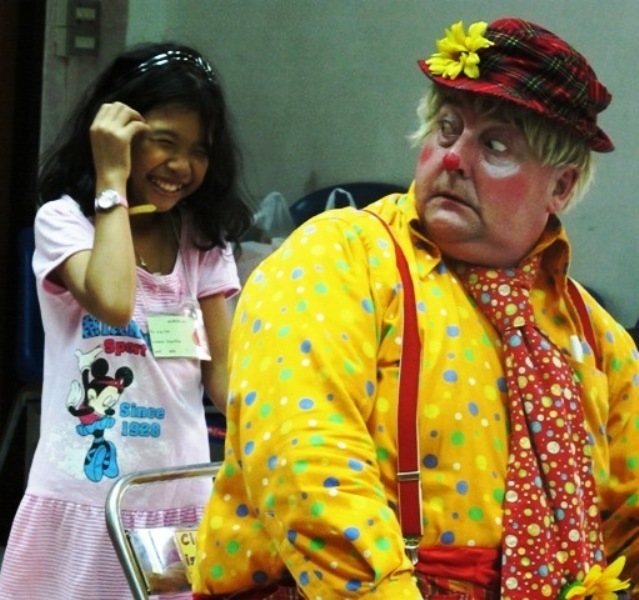 He's a regular feature at all the major charity events in Bangkok and has even become known as "The Ploenchit Fair Clown" at the annual fund-raising event organised by 'The British Community in Thailand Foundation for the Needy' in Bangkok. Eckie is always keen to find out about places in Bangkok or anywhere else in Thailand where he can offer his shows for free. Please let him know If you have a place in-mind where you think he might be able to offer one of his free shows? Family Shows - Birthday Parties - Weddings - Schools - Festivals - Hotels - PR Events - TV & Movie productions - Charity Events. "And - Whenever you need A Jolly Good Laugh"
Eckie's traditional clown shows have been carefully arranged and practiced over many years of performing for audiences all over the world. As one of the few remaining Music Hall or Variety acts who is still offering live slapstick comedy shows. His unique productions are like classic cartoons and his performances are enjoyed over and over again. 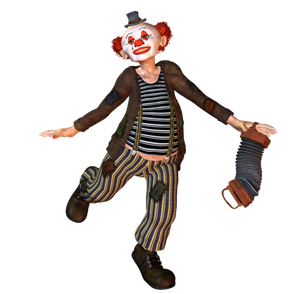 His mime skills make Eckie a perfect choice for performances anywhere in the world. Since 1984, he's performed in Europe, Scandinavia, US A, The Middle East, India, China & all over S/East Asia. A Unique act - More than just a Clown! He is in a class of his own. No one does what this cheeky chap can do. Expect the unexpected from this most genteel of whimsical characters. This slow old man never seems to get it right. If you don't cry with laughter, you will probably cry because you feel sorry for him. Whether children are young or old - the routines always have something to keep their attention and create hilarious fun. Don't forget the adults enjoy the shows too! and very proud to be so! Recognised as being the only choice of family entertainer for people who demand the very best family entertainment for their special occasions. Her Excellency Ms Quentin Bryce AC - Governor General of the Commonwealth of Australia attended a charity performance by Clown Eckie. Commendation from - His Excellency Mr. William Paterson, past Australian Ambassador, Bangkok. Clown Eckie is a master of his trade, but has in particular impressed me with his empathy and capacity to engage disabled and disadvantaged kids in Thailand, having them rocking with laughter and totally immersed in his presentations. Although this is all about fun, it was quite moving to see him draw these children out and get them to participate. His modest and self-deprecating manner is appealing and his range of tricks is wide and varied and accomplished with expertise. Clearly, he could relate to any audience. Overall, a polished performer, and a lot of fun both for children and their parents. An Unusual commendation from His Excellency Mr. Quinton Quayle. past British Ambassador Thailand. "Clown Eckie also performs at every Christmas party at the British Embassy"
﻿Since he became a resident in Thailand in 2000, Eckie has been busy finding ways to offer a simple gift of happiness to as many poor people as possible in his adopted country. By the year 2005 he had gathered a small group of friends, and together they managed to raise enough money to start the long drawn-out background checks and legal proceedings which eventually lead to the establishment of a properly registered charitable foundation in Thailand. 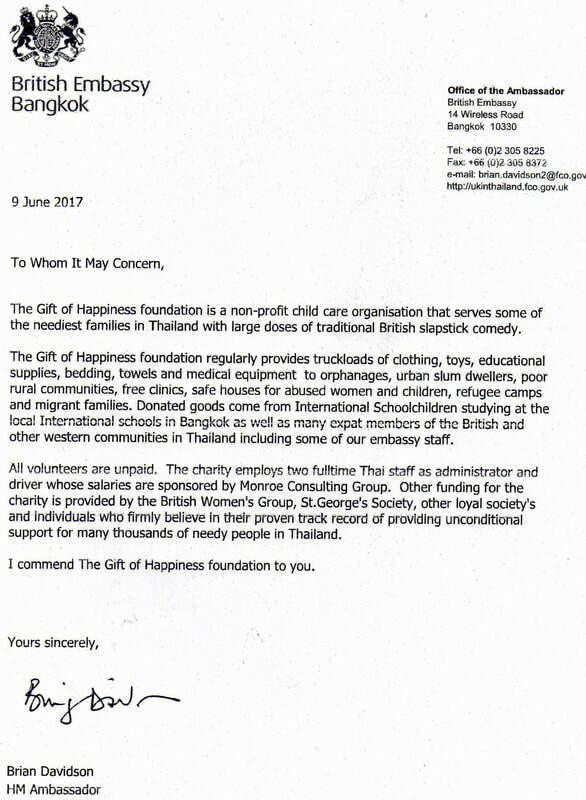 ​Full charitable status for the Gift of Happiness Foundation was granted by the Royal Thai Government on the 15th December 2009. Full membership of the League of Foundations of Thailand was granted in March 2010. Clown Eckie is serious about making other people happy? Time for an important note! Is Director of a properly registered organisation in Thailand. Has police clearance (safe to work with children). File number: F090729-38668. Is proud to be honored by Rotary International as a "Paul Harris Fellow"
What a Clown does is as wide as a church door or as delicate as a rose. The right or wrong move - too many or too few - their placement or emphasis can determine whether it’s a total dud or fall down funny...The difference between a delicate glow-worm and lightning! Clown Eckie has the experience to deliver the perfect moves at the right time and in the right place, every time he performs. "Be sure to have him at your next party!"